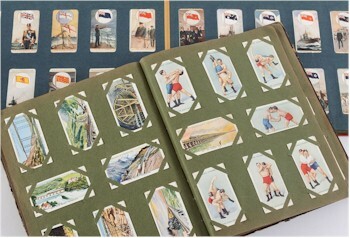 Postcards and cigarette cards are hugely collectable items. Postcards arguably were at their zenith during the Edwardian period in terms of popularity, being used in ways somewhat akin to today's text messages and emails. Postcard collecting is a very broad area with postcard collections usually being curated by subject, manufacturer or artist. A collection of assorted postcards including glamour, locomotives, Royal Navy, nautical and others (SC20/839). Typical subjects include actors and actresses, shipping, aircraft, topographical views, schools, country houses, wars, battles and the military as well as royal and noble genealogies to name but just a few! Prominent postcard manufacturers include Raphael Tuck and his wife Ernestine who worked from London and were early pioneers of this new phenomenon. 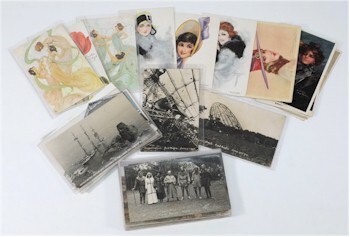 An Edwardian postcard album containing assorted postcards including, glamour, military, naval, shipping, actresses, humour, patriotic and others (SC20/870). Artists include Mabel Lucy Attwell (who was known for her nostalgic drawings of children, which was based on her daughter Peggy); Bruce Bairnsfather (who focussed on World War I subjects); Ralph Kershner (art nouveau) and Donald McGill (with his saucy seaside cards). A lot of postcards were painted in Saxony, which was a centre of good-quality printing, making it an ideal place for postcard production. Photographers were also heavily involved in producing postcards and would typically produce short-runs that are very collectable today due to their limited supply. A collection of sets and part sets of Players, Churchman and other cigarette cards in two albums (SC20/861). Cigarette cards were produced in considerable numbers between 1910s and 1930s. Manufacturers such as Players, Ogdens, Wills and Salmon & Gluckstein were prominent amongst tobacconists who produced sets of cards that were distributed in their cigarette packets. Cigarette card sets typically comprise of between 25 and 50 cards covering a variety of topics. It is the subject matter and date that determine the value of a set of cigarette cards with some fetching as much £6,000-£8,000 per set and some individual cards easily commanding four figure sums at auction.